I’m just going to break it to you now: this appetizer is definitely not healthy. Like, not even remotely. As in, I-bought-Velveeta-for-the-first-time-in-my-life-for-this-recipe levels of unhealthy. But it’s worth it. I mean, there’s nothing quite like semi-food Velveeta to keep your queso at a smooth, dip-able consistency even after it’s cooled. A liberal sprinkling of turkey chorizo (don’t @ me, it’s actually really good) rounds things out with another layer of crumbly texture and warm spice. After the chips are gone, you’ll be licking the bowl with this one. 1. Heat oil in a skillet over medium-high heat. Add chorizo and cook, stirring and breaking up with a spoon, until browned and crisp, 8–10 minutes; set aside. 2. Heat half-and-half and Velveeta in a large saucepan over medium heat, stirring occasionally, until Velveeta is melted, 6–8 minutes. Add Monterey Jack and cheddar; cook, stirring, until mixture is smooth. Mix in chipotle chiles, salt, and chile powders. 3. 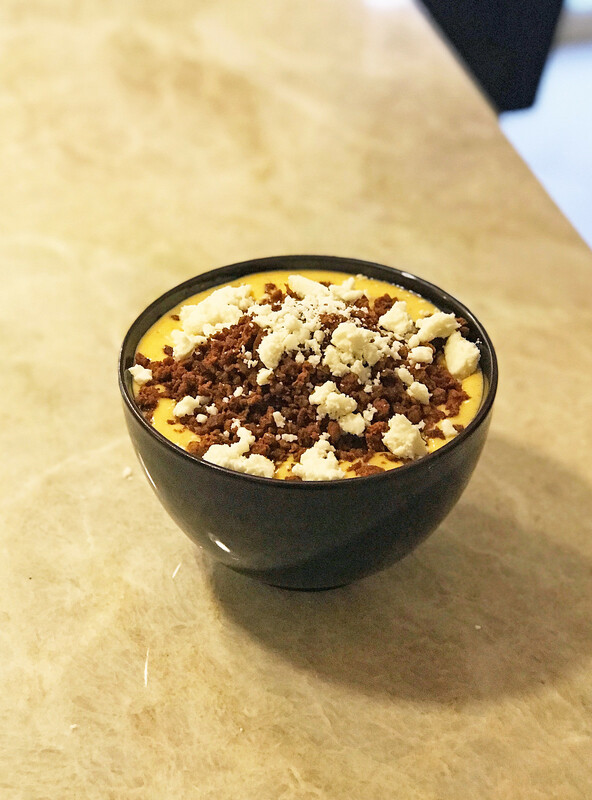 Transfer queso to a warm bowl and top with chorizo. 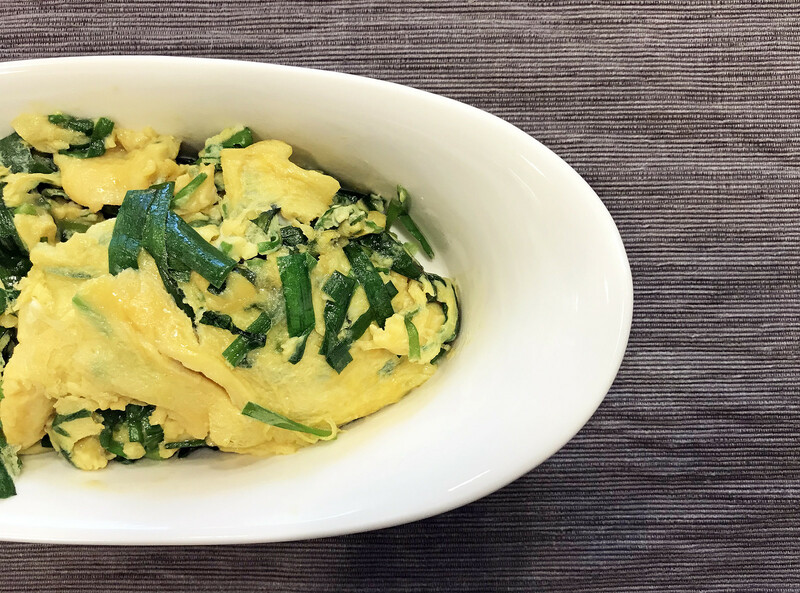 I probably make these scrambled eggs at least once a month. Easy, healthy, and delicious, they make a perfect breakfast (who am I kidding, I make this for dinner all the time too). You can serve this atop rice, but I prefer these soft and warm eggs by themselves. Make sure to get Asian garlic chives for these, as the flavor and texture are completely different than your standard grocery store chives. 1. In a bowl, beat the eggs, sugar, soy sauce, salt, and dashi together until blended. 2. Heat the oil in a nonstick frying pan over medium-high heat, then add the garlic chives, sauteing for a couple of minutes until they’re bright green and wilted. 3. Pour the eggs into the pan and turn down the heat to low. Let the eggs cook, undisturbed, until you see the bottom of the eggs turn opaque. 4. Give the eggs a gentle stir, scraping the cooked egg up from the edges off the bottom of the pan, and allowing the raw egg at the top to run underneath. Let this cook until the bottom layer turns opaque and stir again. 5. Repeat step 4 until the eggs have reached your desired doneness (I like for much of the eggs to remain soft and opaque). Remember that the eggs will continue to cook a little after you turn off the heat. Serve warm. 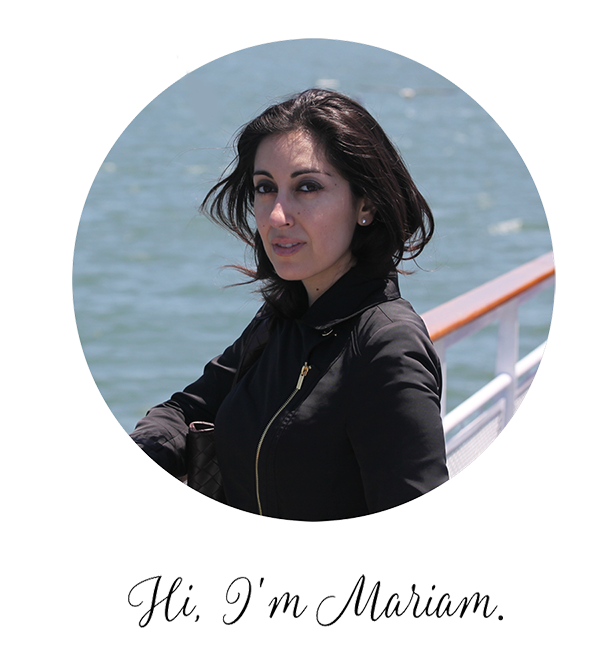 Every year, denizens of the Bay Area eagerly await a very special season. The weather is getting chillier, the nights are getting longer, and a very special something is along the way: Dungeness crab. Outsiders may ridicule our obsession, but they haven’t tasted the sweet, juicy, tender delicacy that is Dungeness. And no holiday season is complete without a few crabs at the table, right? Creamy, salty-sweet, and easy to prepare ahead of time, these get eaten up in an instant. You might want to make extra. 1. Fill a large bowl with ice water. In a saucepan, cover the eggs with water by 1 inch and bring to a boil. Cover and remove the pan from the heat. Let stand for 10 minutes. Drain the eggs and transfer to the ice water bath to cool completely. 2. Peel and halve the eggs lengthwise. Transfer the yolks to a medium bowl and mash with the back of a spoon. Arrange the egg whites on a platter. Add the mayonnaise, mustard, shallot, 2 tablespoons of chives, parsley, capers, thyme, vinegar and Tabasco to the bowl with the egg yolks and mix until smooth. Season with salt. Transfer the mixture to a piping bag and fill the egg whites. 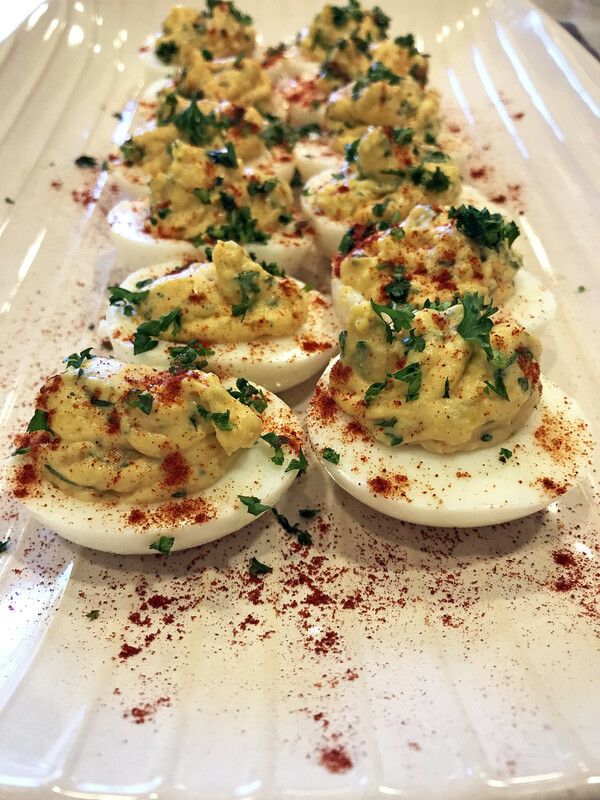 Top each deviled egg with some of the crab and garnish with roe and chives. You know a food trend has arrived when you see frozen bags of it at Trader Joe’s (no disrespect to Trader Joe’s, purveyor of all things delicious, whimsical, and well-priced). 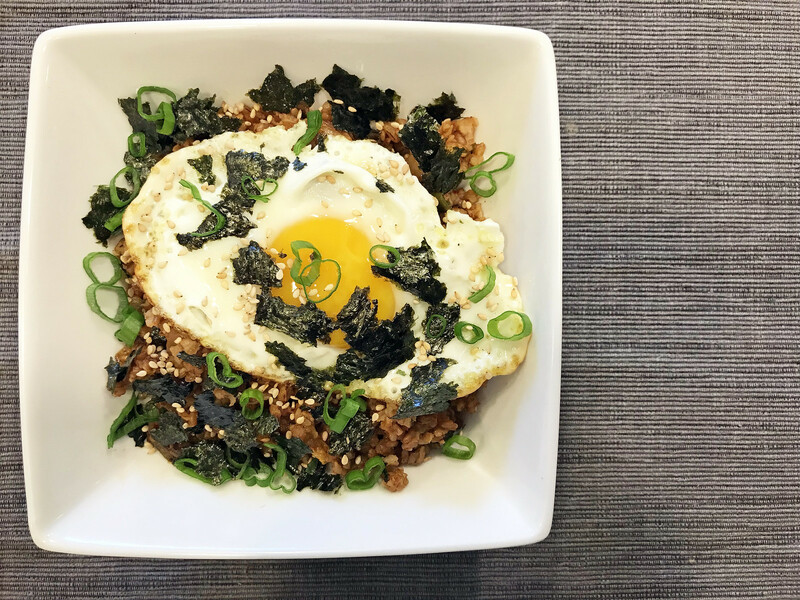 So once I started seeing frozen kimchi fried rice in their aisles, I wondered how else I could riff on one of my favorite weeknight dishes. Enter alt grains. Why not kimchi-fried bulgur? A little Middle Eastern-East Asian mashup, if you will. It’s just as easy as kimchi fried rice, but more filling, and pretty guilt-free. Put an egg on it and you’ve got yourself a complete meal. 1. Chop kimchi; set aside. Cut green tops from green onions and thinly slice; set aside. Thinly slice white and pale green parts and set those aside too. 2. Heat olive oil in a large nonstick skillet over medium-high. Crack eggs into pan; season with salt. Cook until whites are golden and crisp around edges and puffing up and set near yolks, about 4 minutes. Transfer eggs to a plate. 3. Return skillet with oil to medium-high heat, add carrot, and cook, stirring, until slightly softened, about 2 minutes. Add reserved white and pale green parts of green onions and kimchi and cook, stirring often, until scallions are wilted, about 3 minutes. Add grains, soy sauce, sesame oil, and reserved kimchi juices; cook, stirring, until grains are slightly softened, about 2 minutes. Season with salt; divide between 2 plates. Top with eggs, then nori, sesame seeds, and reserved scallion tops. I hated eggs growing up. I’m talking complete revulsion: eggs were up there with monsters and flu shots for me. But somewhere along the way, my adult tastebuds changed their mind and these days, eggs are one of my favorite foods. I can’t get enough of them. Especially deviled eggs. 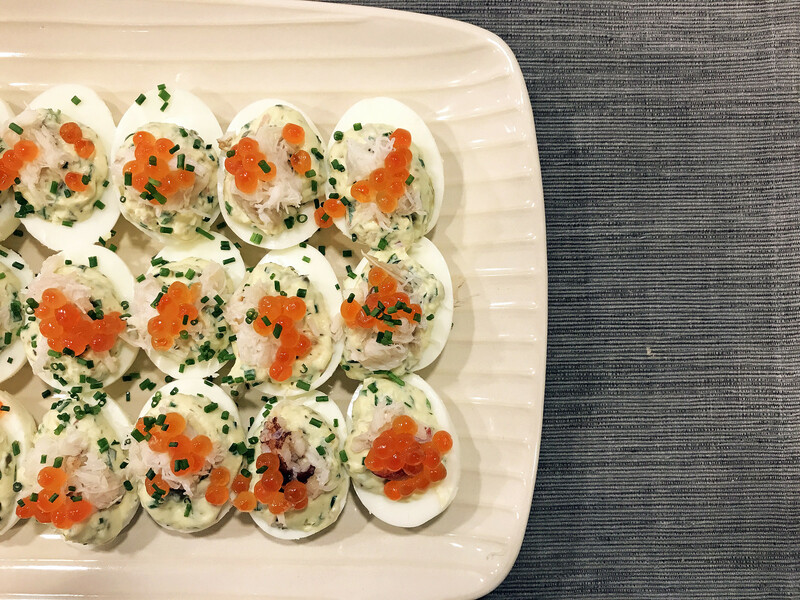 One of my favorite ways to prepare deviled eggs is with Dungeness crab, but the season only lasts a few months. So for the other half of the year, I make this Spanish version, which is just as delicious. Flecked with paprika, chopped almonds and a generous amount of olive oil, the quality of your ingredients makes all the difference here. These are perfect as an appetizer or alongside a green salad for a light lunch. 1. Put the eggs in a saucepan and add enough cold water to cover by 1 inch. Put the pan over high heat. When the water boils, turn off the burner and let the eggs sit in the hot water for 10 minutes. Remove eggs from the pan, transfer to an ice bath, and let cool. 2. Peel the eggs, halve lengthwise, and ease out the yolks into a bowl. Arrange the whites on a serving platter. 3. Peel and chop the garlic, sprinkle with a pinch of salt, and use the side of a chef’s knife to smash the garlic into a paste. Add the garlic to the bowl with the yolks, along with the olive oil, mayonnaise, almonds, lemon juice, parsley, paprika, and 1/4 teaspoon salt. Use a fork to smash the yolks and blend the ingredients. Taste and add more lemon juice or salt if needed. 4. Pipe the mixture into a pastry bag or ziploc cut with a 1-inch hole. Divide the mixture among the egg whites. 5. Garnish the eggs with more parsley and a dusting of paprika. Serve at room temperature.